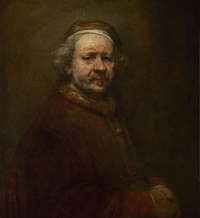 About the artist: Rembrandt van Rijn (1606 – 1669) was a Dutch draughtsman, painter and printmaker and is considered one of the greatest artists of all time. Unlike most Dutch masters of the 17th century, Rembrandt’s works depict a wide range of style and subject matter, from portraits and self-portraits to Biblical and mythological scenes and animal studies. His reputation as the greatest etcher in the history of the medium was established in his lifetime and never questioned since. For twenty years he taught many important Dutch painters at his home studio in Amsterdam. Rembrandt was an avid art collector and dealer. He never went abroad, but he was heavily influenced by the work of the Italian masters of his time. Rembrandt’s wife Saskia van Uylenburgh was the subject for many of his works, painted in a grand, obstinate style, perhaps to reflect their wealth and status. In the late 1640s, Rembrandt entered a relationship with his maid, Hendrickje Stoffels. Many critics believe that she too features in his works, most notably A Woman Bathing in a Stream, 1663. Rembrandt died in 1669. Due to living beyond his means, he was buried as a poor man in an unknown grave in the Westerkerk church, Amsterdam.